What lessons from the horse meat scandal can be applied to the supply of forklifts in Scotland? There has been so much media coverage of the failings of the food supply chain in the UK that we are reluctant to even mention the subject. However, there is a lesson to be learned. 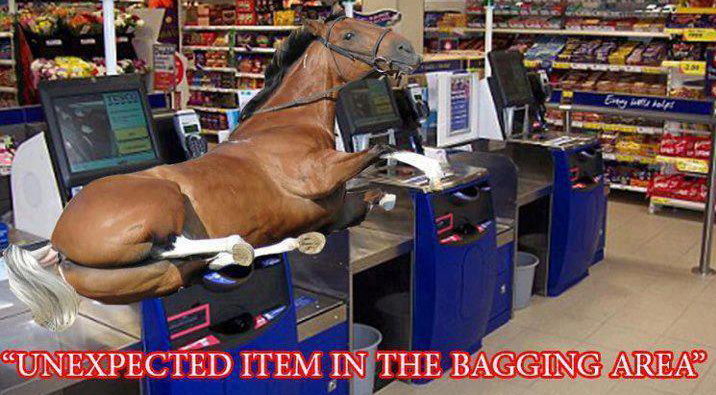 It is surprising that the horse meat was allowed to get into the food chain without some form of checks taking place. We find it extraordinary that major retailers and food suppliers have allowed themselves to be caught out in this manner. Was it a case of negligence or turning a blind eye in the constant strive for ‘cheap’ produce, with no consideration for consequences? You are probably wondering what this has to do with the sale or hire of forklifts in Scotland? EVERY forklift supplier in Scotland, be it in Glasgow, Edinburgh or John O’Groats, has a responsibility to ensure the fork truck and the parts they supply are of approved quality. Just imagine the consequences of someone fitting a brass bolt instead of high tensile strength steel and the catastrophic consequences this could cause. This is why we at Access Mechanical Handling are approved by an independent standards authority ( i.e. ISO approved ). This ensures that all suppliers to Access Mechanical Handling meet strict industry guidelines. These suppliers MUST be approved before ANY of their products are used on any forklift, or any other form of material handling equipment. If there is any question about quality this can be IMMEDIATELY traced and investigated. If the forklift truck industry can do this, with all the various small parts and their suppliers, why couldn’t the food suppliers? The other point about the meat scandal is that price became the king and all interest in quality was thrown to the wayside. The clear lesson here is that if you buy cheap then there are bound to be future costs and you’d better be prepared to pay for any shortcomings. What cost now to the major retailers? If they had ensured the quality of the product they were selling, they would not now be facing the financial price of recalling all the food from the shelves or the potentially more expensive damage of loss of customer trust and loyalty. Look beyond price : really study what the complete offer is… methods of support, expertise and product knowledge. Consider the VALUE of the offer. Ensure your supplier has some form of independent audit of the products they supply, ideally with an ISO certificate. Are they members of the fork truck industry’s professional body? Check with the FLTA that what they say is genuine. This way you can know that you are buying with confidence and minimise future expenses. At Access Mechanical Handling Ltd, we are full members of the Fork Lift Truck Association and are fully certified to BS-EN-ISO 9001:2008 Standard. If you’d like to find out more about how Access Mechanical Handling can help you in your forklift needs throughout Greater Glasgow, Edinburgh, Ayrshire and all over Scotland, drop us an email or give us a call o 01698 745859. We’re happy to help.